This month’s Loot Crate was simply going to be good. With a theme like “Time”, how do you go wrong? Doctor Who, Bill and Ted, Back to the Future (and it was the official BttF day), Time Bandits, The Time Machine – there’s no lack of awesome time travel possibilities out there! I couldn’t wait to open my crate when it arrived and I was not disappointed! Back to the Future II replica Hoverboard at 1:5 scale with papers. 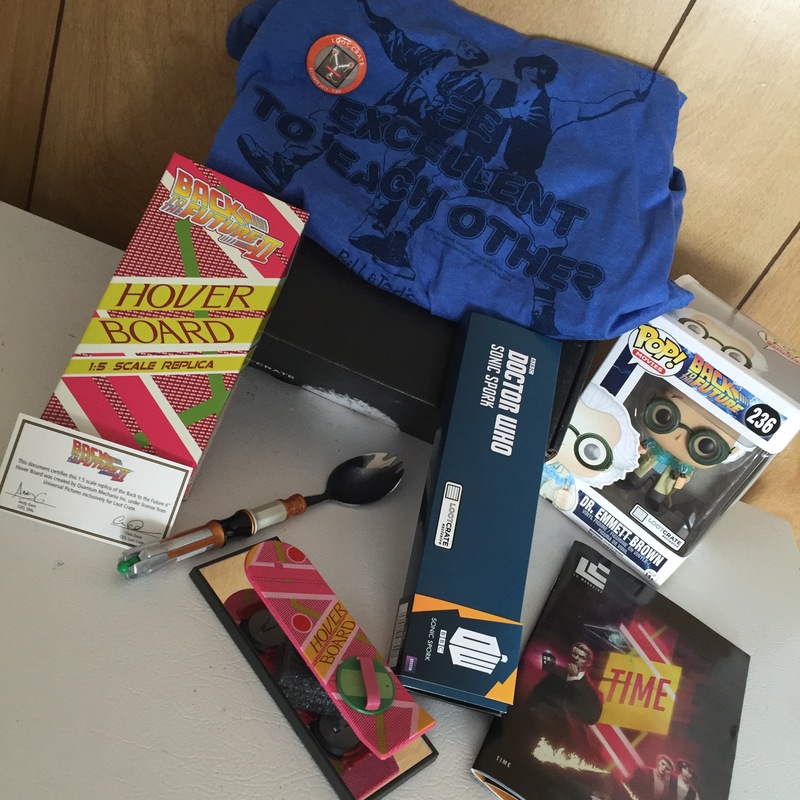 Sonic Spork – Exclusive from Lootcrate/BBC/Doctor Who. Bill and Ted tee – “Be excellent to each other”. Pop Vinyl #236 Back to the Future Dr. Emmett Brown Lootcrate Exclusive. Flux capacitor on the theme mini-flair. Inside of the box had the phone booth with the party dudes. LOVE IT! This has definitely been the most excellent of Loot Crates. I’m keeping everything! I still want a crate that is a little more geek gurl friendly, but at least this one was good enough to make me squee over every item. I just have to say, isn’t Doc Brown super cute? Biggest complaint: The Sonic Spork – needs more sonic. That thing doesn’t light up or even make a noise. However, it’s fun to use a spork that looks like it springs forth from a sonic screwdriver. It’s also fun to use a spork. OK, it’s also fun to say spork. A spork? Really? It’s the kind of efficiency I don’t put past the Doctor. Want your own Loot Crate? Subscribe now!